Carlie’s Dolman Hacked to Sheath Dress – Everything Your Mama Made & More! 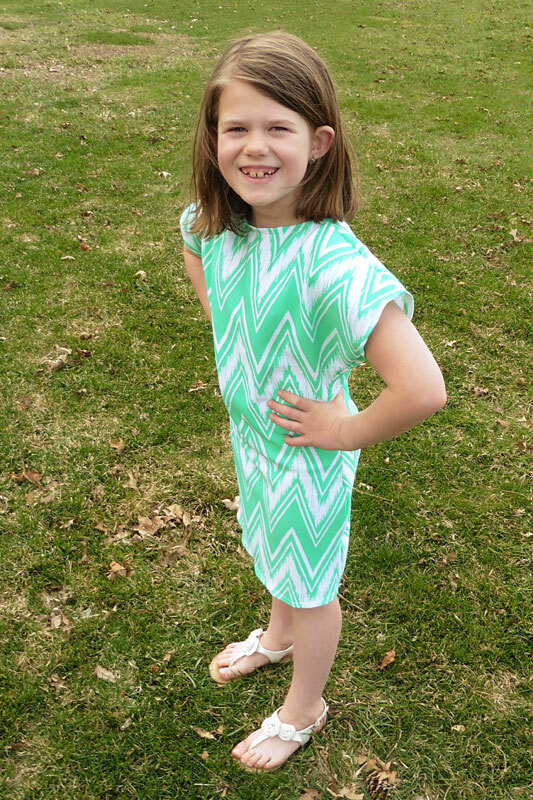 As the Freestyle Harems Blog Tour wrapped up, I decided it was high time I turned my attention toward sewing up Easter clothes for my kiddos. I’m not sure how I let it slip to the end of my to-do list until less than 2 weeks before Easter, but since I have no time left to shop for specific fabrics, there goes my hopes to put together perfectly coordinated outfits (my wallet appreciates it, though, lol). Luckily, my girls were more than happy to dig through my stash and pick out fabrics for their dresses … haha! 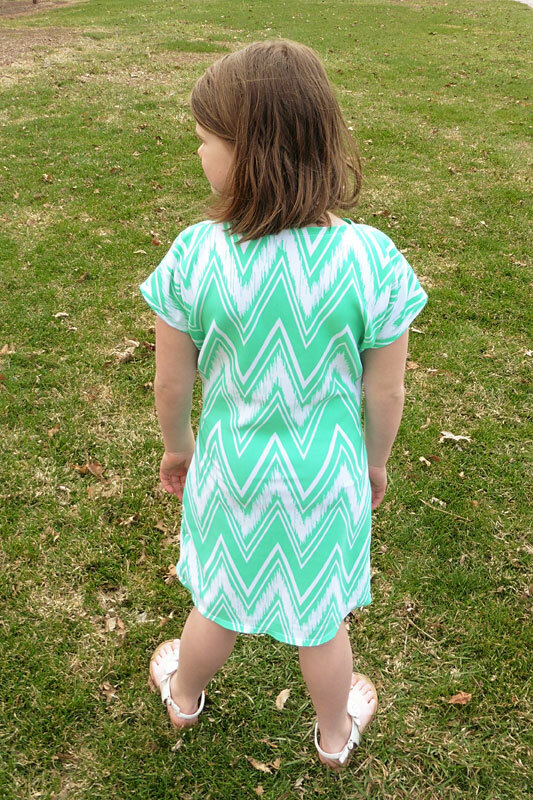 My younger daughter chose this mint and white shaky chevron printed scuba knit that I got recently in a Girl Charlee bargain lot. The large scale of the chevrons called for a simple dress and I thought the fabric’s thickness would lend itself well to a sheath style, so I decided to hack Carlie’s Dolman Top to hit her at knee-length. To decide how much to length to add, I measured my girl from shoulder to knee. My 4’2″ daughter measured 29 inches from the top of her shoulder to her knee. I added another inch to account for the shoulder seam allowance and the bottom hem. Then I laid the view B version of the dolman pattern along the fold of my fabric and extended the side seam edge so that the bottom was 30 inches from the top of the pattern’s shoulder. To give her hips a little extra wiggle room, I also added an inch in width to the pattern for the skirt area. I started angling it out about 4 inches above the bottom of the original shirt hem and then went straight on down to the new skirt hem (because the front and back are both cut on the fold, adding an inch to the pattern pieces’ width means an extra 4 inches around the circumference of the skirt). The only other alteration I made was to cut the neckline narrower. I simply used the instructions included on page 7 of the Carlie’s Dolman Top pattern. I am so glad that this was a fast sew and is so cute on her! 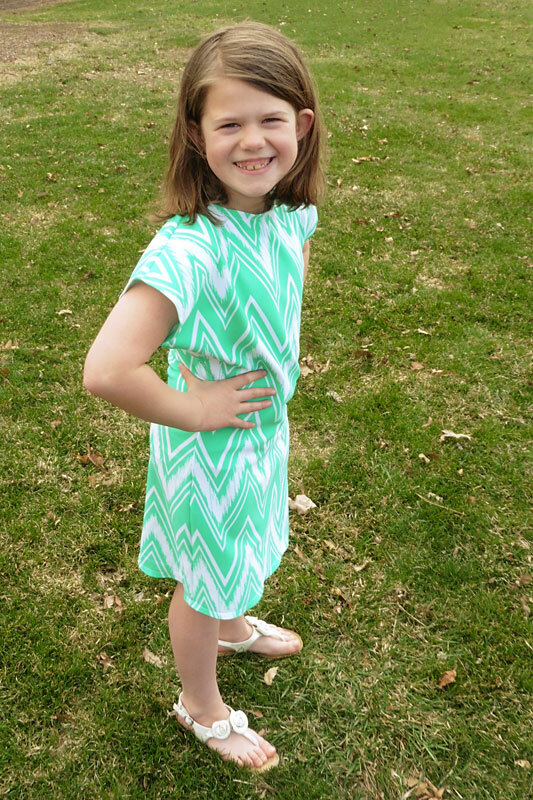 Now, on to the other girl’s dress and 3 boys’ shirts … and, if I’m lucky, I might find time to make myself a new dress!